The Whetstone Park of Roses is a very large rose display. As a park, it is one I have visited all throughout my 56 year lifespan, so I have seen it change and noted the development of it. I don’t think I have ever seen it look better than it does now. 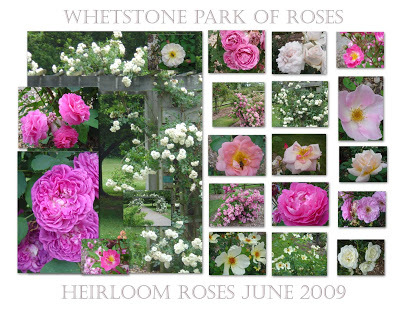 The heirloom rose display is among the newer portions, although it has been in place for a number of years now. Located at the endpoint on a rise, it is the last feature as one moves through the wide paths of the park, the pinnacle, as it were. It peaks in early June, while the hybrid teas that make up the larger share of the central area are at their height, now, in the middle of June. Because most old roses bloom only once, and many have smaller blooms than the hybrids, you might ask why grow them except for curiosity sake, but these oldtimers have a number of attractive assets. One, they are survivors. Many of them have the shrub qualities and sturdiness of constitution that has given them longevity in the old gardens where they were rediscovered and collected. Another reason is their magnificent scents, like many old fashioned varieties of flowers the fragrance has not been bred out of them, and they are redolent of nuances such as the descriptions indicate: myrrh, fruity, meadowsweet, vanilla, tea, musk, wine, pear-drops, and more. Who isn’t seduced by such aromas? A third quality is their floriferousness when they do bloom. Cascades of flowers cover the graceful boughs and bend them with color and scent. Bursting with a generosity of bloom is a common characteristic of many of the old roses. Like many, I am enthralled with the charms of the old roses. They evoke feelings and thoughts of rich sentiment and fantastical imaginations; what is Titania’s Bower without the rose and the honeysuckle? It is that heady combination of June scent, and almost wild abundance of growth that sets the stage for summer. You almost find yourself in such dreams in an old fashioned heirloom rose garden. Be sure to see Gardens in Ohio and A Botanical Garden Wedding. My neighbor has a rose bush that she butchers every year but it comes back even more gorgeous than the previous year. I should take a pic because it looks like one in your collage. Please do! Partly because it would be interesting to try and identify it and partly because you take the most beautiful garden pictures of anyone I know. Recovered from the garden spring fling? No one, looking at images of those gorgeous roses, could ask why grow them, IMO. Most hybrids are very boring in comparison. I just wrote about roses for next week’s paper. Did you know Ronald Reagan proclaimed them as our National Foral Emblem in 1986?